Home / Blog /Marketing/Free 2016 Marketing Calendar – Plan Ahead for Your Online and Retail Promotions in the USA and Canada! Free 2016 Marketing Calendar – Plan Ahead for Your Online and Retail Promotions in the USA and Canada! 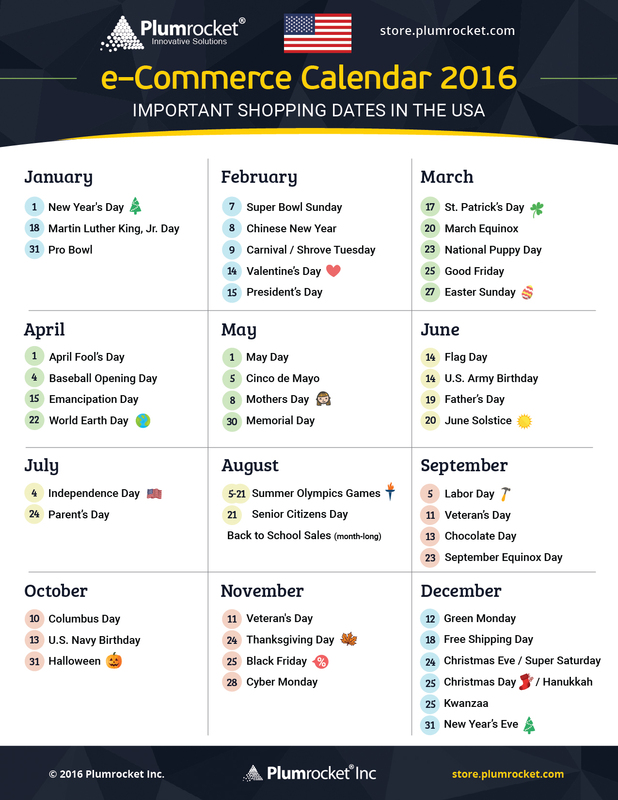 It’s essential to know all the important shopping dates for any ecommerce store. Every marketing specialist should use ecommerce calendar in order to better prepare for the upcoming sales ahead of time. Without a doubt, all shoppers remember some of the key retail dates. Holidays such as Valentine’s Day, Easter, Mother’s Day, Christmas, and Black Friday are among the most favorite days for any buyer. But what about the rest of the holidays? At Plumrocket we have compiled the catalog of marketing calendars for North America, Europe, Nordic Countries, Asia-Pacific and Latin America. 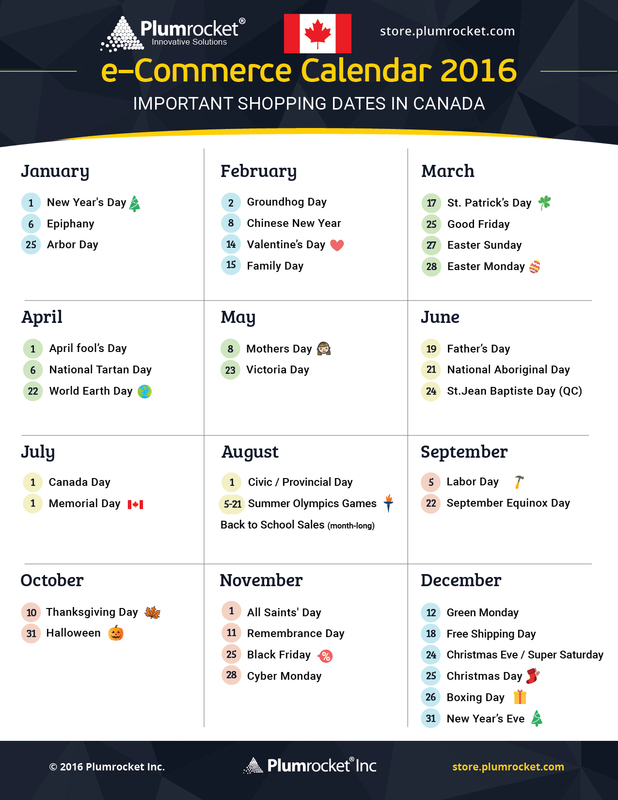 In this post we will start with email marketing calendars for the USA and Canada. It takes time to prepare for the holidays, so plan ahead to make sure you have put everything in order. Set your expense budget, work on your marketing strategy, update your inventory and plan your stock. Get ready for each important holiday and never miss a good opportunity to increase your sales. Last thing to remember is that people start looking for gift ideas long before the actual holiday date. Let’s take “Father’s Day” for example. According to the 2016 marketing calendar, the holiday is on June 19. 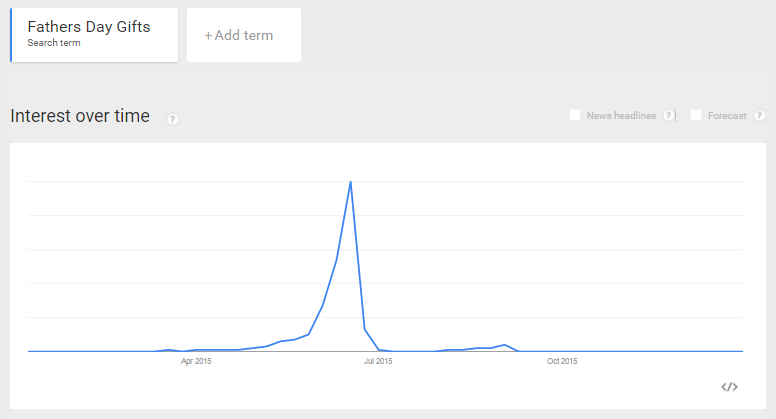 But if you use Google Trends tool, you will see that shoppers start looking for Father’s Day Gifts – one or two months in advance (In April/May). Use this information to your favor by creating new product categories at your store. An example of such category can be “Best father’s day gifts in 2016” or create a blog article like “Top 10 Father’s Day Gift Ideas”. Then start email marketing campaign to notify your subscribers about interesting content at your site before the actual holiday begins. Right click on the marketing calendar image below to save it as “JPG” file or scroll down to download printer-friendly version in “PDF” format. We did our best to include all the important dates into the calendars. Please don’t hesitate to drop us a comment if you wish to add another shopping date to your country’s calendar. It’s important to remember that each holiday season should bring not only sales to your store but also joy to your customers. We wish you a success in 2016 and hope that our marketing calendars will become useful to your business. Join Plumrocket at Magento Imagine 2016!